As a young girl growing up in Italy, I always loved tasting my mothers baked goods. Seeing all the smiles it would put on friends and families faces are some of the fondest memories I have. It was then I knew that I also wanted to be a part of putting those smiles on peoples faces. When I was a young teenager, I made the voyage with my family from Italy to Canada. It wasn't long after that, I started working along side Gerry and Janet McCall, who are the founders of McCalls Cake Decorating School. After 14 years of learning from some of the best, I found myself taking on a new adventure under Nicola Ventola, one of the original founders of La Sem in Canada. All the knowledge I've gathered over the years added to the passion I had "baking" to own my own bakery. Thus, in 2007 I made a leap of faith and opened Irene's Celebrity Cakes Inc. With over 35 years of experience I can truly say that my motivation to put smiles on peoples faces is stronger than ever. All of this couldn't be accomplished without the help I had making my way through the industry, the support of my family and friends and of course our loyal customers. Thank you! 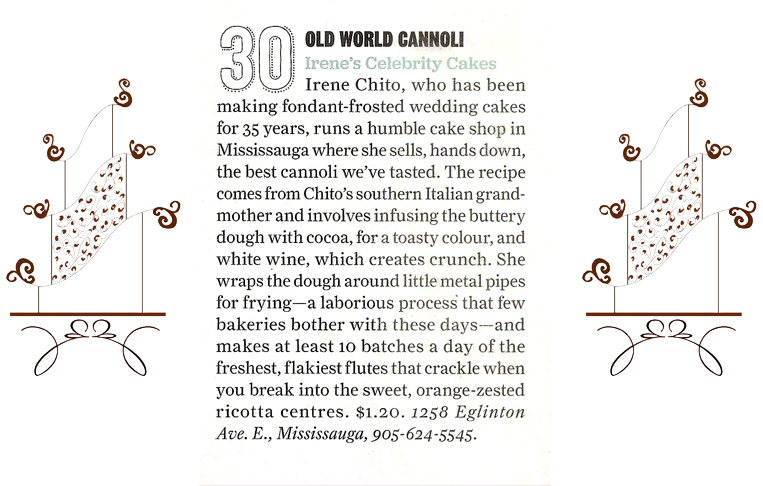 Over the years, we at Irene's have have been recognized in the Toronto Life magazine for our famous cannoli. You can read the Toronto Life article below.